Hello Vintage: More finds here than I thought I had! I have been waiting for a particular Lions Club op shed to re-open as it has been closed since Christmas. My Sister-in-law told me it had HEAPS of stock this time last year on it's first day back. Expectations were high. My sister and I got up early and got to the shed on opening (which was amazing since it was rush hour traffic and took a ridiculous amount of time to get there). I had the squids with me so I had the pram. I tried to keep it out of the way of the bargain hunters but I got so many dirty looks anyway (sad face). Made me wish I wasn't a nice person because then I could just bowl them over! I must say though that before I was a mum prams used to frustrate me - lol. Thrifters had jumped on all the best stuff by the time I had navigated the first aisle. Isn't it frustrating when you see really cool stuff out of the door! It was fun anyway and at least most of my money stayed in my pocket! Here is what I bought. Excuse this pic, I forgot I had bought this so I have only just taken a pic and needed a flash. I said in another post 'what is it with me and chairs' well I am also wondering 'what is it with me and foot stools'. I now have a pouffe, this stool and another that I picked up late last year that I have not posted here yet. This was $6. 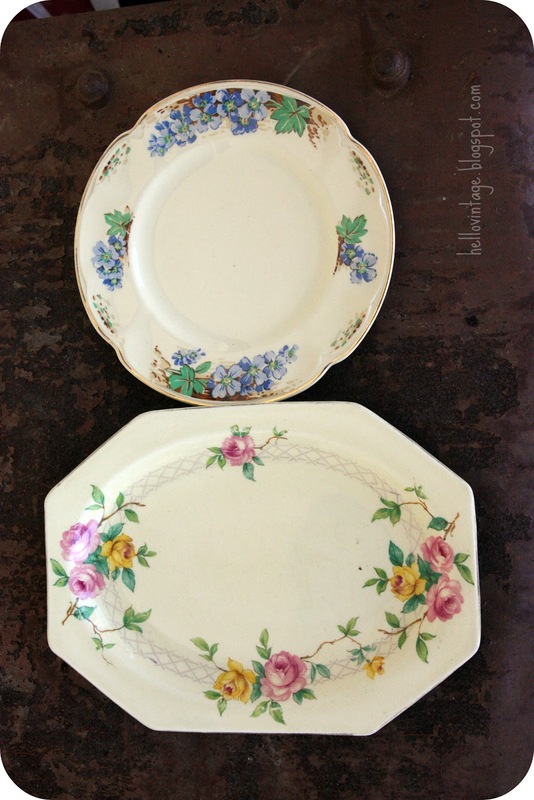 The top plate is a Johnson Bros and the bottom Royal Staffordshire, pretty don't you think? Only a dollar or so each. Not sure what is going on my my pics turning themselves sideways! Loving these two finds. 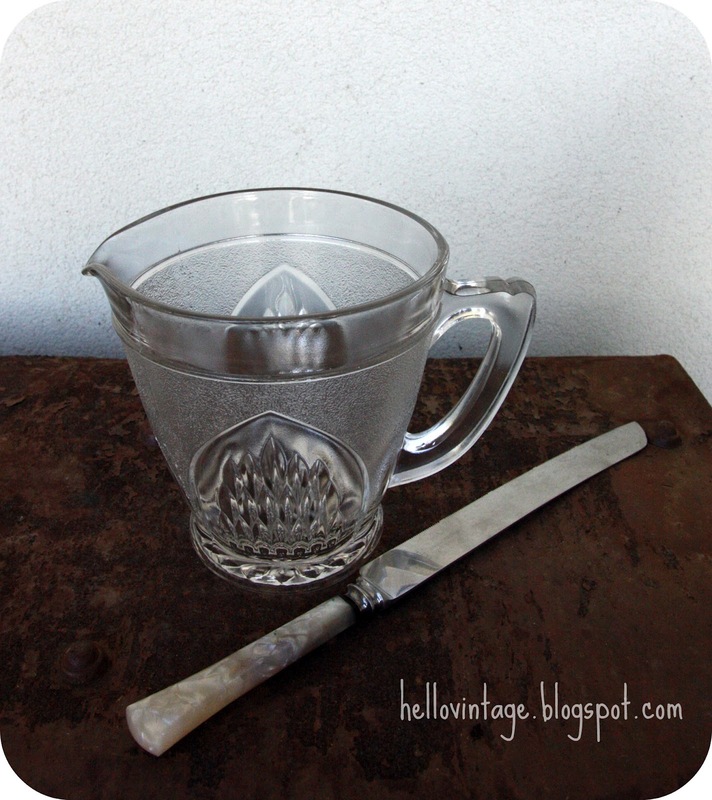 Sheffield Pearlcraft bread knife and glass jug for $5 all up. 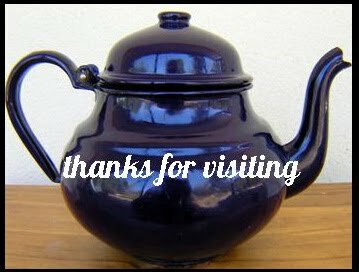 I think the jug deserves a photo on it's own. Love the pattern. I found these lids for my Pyrex for $1 each. $2 for this bright Agee Pyrex. Other finds this week from the Salvos (a bit over priced). Alfred Meakin bowl. Gorgeous but more than I should have paid (there was just something about it that made me do it). 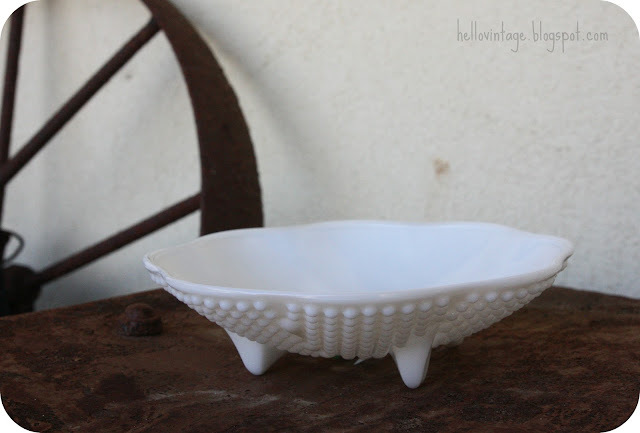 I have said in the past that I am not a fan of milk glass but I really like this shape ($2). 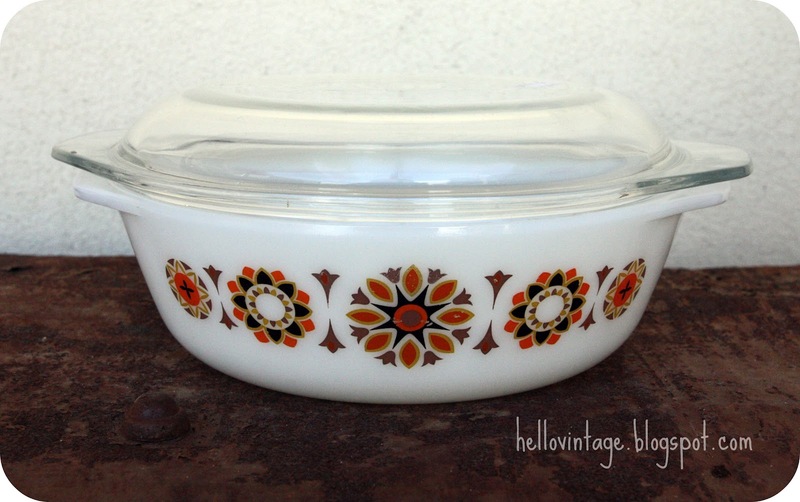 This looks like Pyrex but is not marked on the bottom. Has anyone seen this pattern before? Linking in with Her Library Adventures. Have a fantastic week. 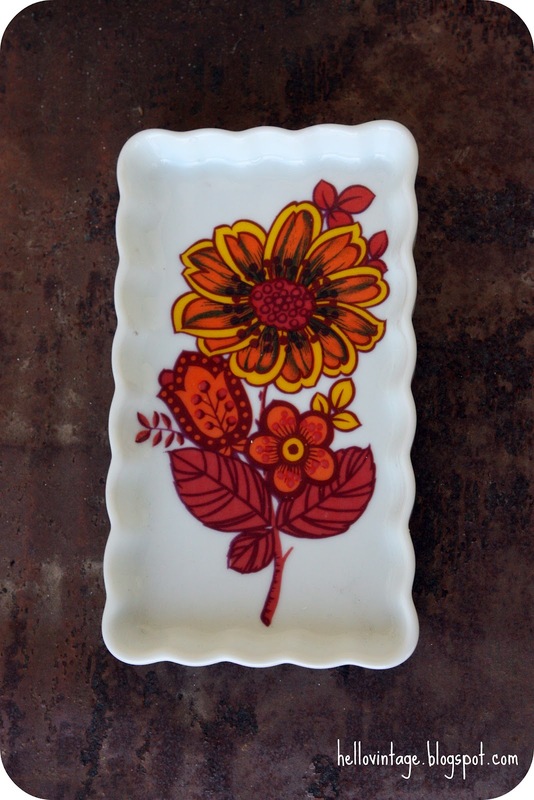 Gorgeous plates - love 'em! Milk glass dish really nice too! You got some great things...to match your great sense of humor! (squids in the pram). If you love something, you can't pay too much, the A. Meakin piece is beautiful. I hope to travel to Australia one day! What a haul! I can't believe you found so many pieces in one trip. Your arms must of been feeling a bit heavy carrying all your treasures. LOL. Some of those patterns were unusual and a couple I haven't ever seen before. - I love the foot stool. - The glass jug is rather lovely. 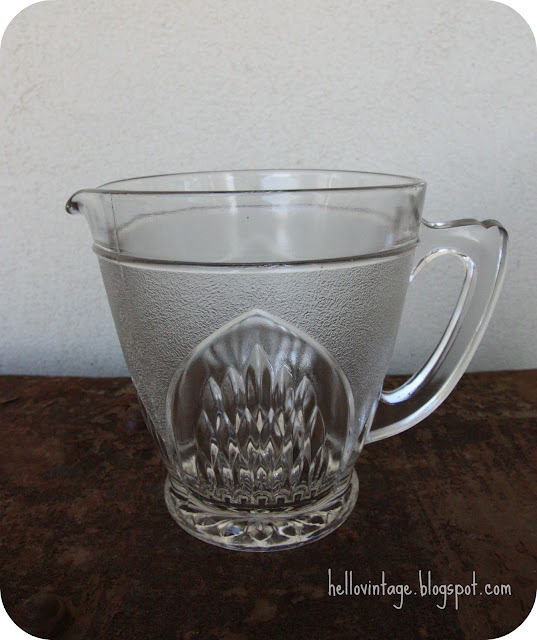 - Score on finding lids for your pyrex! What a FABULOUS bunch of finds.... 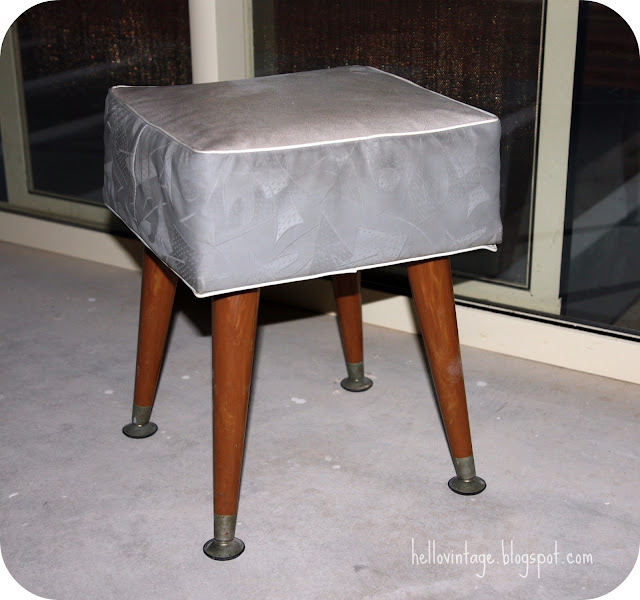 I'm an absolute SUCKER for those cute vinyl retro stools....!!!!! Im HOPING your Melbourne shopping trip is going to include a visit to the Glen Waverley Bazaar as I'd LOVE to meet you.... Maybe I could meet you there & we could grab a coffee....??!! Let me know if you can spare a moment....!!!! Oh! Must have missed this! I love to do that but the girls I am going with are not into the same 'stuff' as me so think we are sticking to retail outlets which is a shame but I do need some new things so that is ok. Rain check? That's a lot of finds! Love that stool.I like the legs.I hate when people hog all the lovely things.The place I got my dresser has lockers so if you have a purse/bag it has to go in there.Just love those rose plates and all the lovely pyrex.I haven't started cillecting those yet.lol. You came home with some really neat things. I love your treasures! How fantastic to find lids to fit your dishes! I love finding matching lids, it makes the dishes feel more useful! 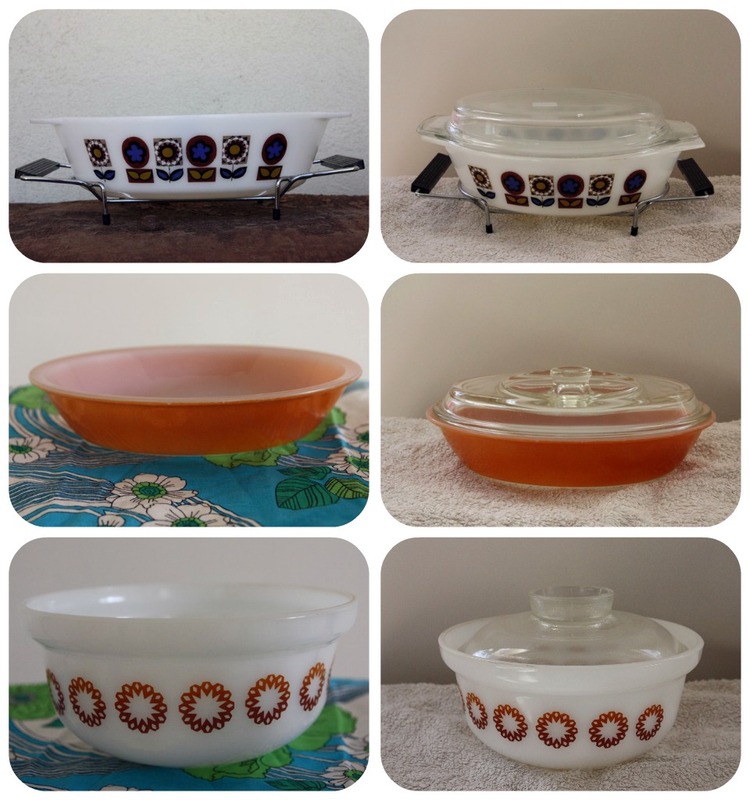 Do u use your Pyrex or just display it? I love the Westminster plate! Gorgeous retro.